Two example input scripts are given, including shocked alpha quartz and shocked liquid methane. The input script first equilibrate an initial state with the quantum thermal bath at the target temperature and then apply the qbmsst to simulate shock compression with quantum nuclear correction. The following two figures plot related quantities for shocked alpha quartz. Figure 1. Classical temperature <i>T</i><sup>cl</sup> = &sum; <i>m<sub>i</sub>v<sub>i</sub><sup>2</sup>/3Nk</i><sub>B</sub> vs. time for coupling the alpha quartz initial state with the quantum thermal bath at target quantum temperature <i>T</i><sup>qm</sup> = 300 K. The NpH ensemble is used for time integration while QTB provides the colored random force. <i>T</i><sup>cl</sup> converges at the timescale of damp which is set to be 1 ps. Figure 2. Quantum temperature and pressure vs. time for simulating shocked alpha quartz with the QBMSST. The shock propagates along the z direction. Restart of the QBMSST command is demonstrated in the example input script. Thermodynamic quantities stay continuous before and after the restart. This command performs the Quantum-Bath coupled Multi-Scale Shock Technique (QBMSST) integration. See (Qi) for a detailed description of this method. The QBMSST provides description of the thermodynamics and kinetics of shock processes while incorporating quantum nuclear effects. The shockvel setting determines the steady shock velocity that will be simulated along direction dir. Quantum nuclear effects (fix qtb) can be crucial especially when the temperature of the initial state is below the classical limit or there is a great change in the zero point energies between the initial and final states. Theoretical post processing quantum corrections of shock compressed water and methane have been reported as much as 30% of the temperatures (Goldman). A self-consistent method that couples the shock to a quantum thermal bath described by a colored noise Langevin thermostat has been developed by Qi et al (Qi) and applied to shocked methane. The onset of chemistry is reported to be at a pressure on the shock Hugoniot that is 40% lower than observed with classical molecular dynamics. It is highly recommended that the system be already in an equilibrium state with a quantum thermal bath at temperature of T_init. The fix command fix qtb at constant temperature T_init could be used before applying this command to introduce self-consistent quantum nuclear effects into the initial state. The parameters q, mu, e0, p0, v0 and tscale are described in the command fix msst. The values of e0, p0, or v0 will be calculated on the first step if not specified. The parameter of damp, f_max, and N_f are described in the command fix qtb. 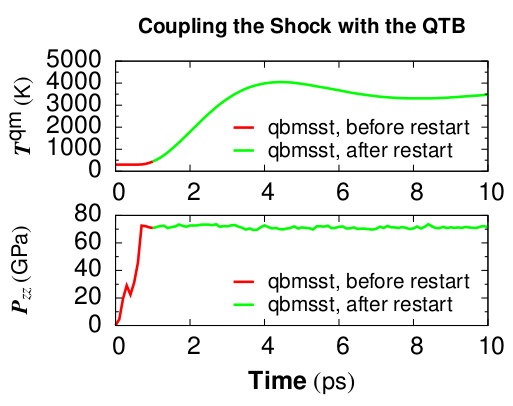 The fix qbmsst command couples the shock system to a quantum thermal bath with a rate that is proportional to the change of the total energy of the shock system, <i>etot</i> - <i>etot</i><sub>0</sub>. Here <i>etot</i> consists of both the system energy and a thermal term, see (Qi), and <i>etot</i><sub>0</sub> = e0 is the initial total energy. The eta (<i>&eta;</i>) parameter is a unitless coupling constant between the shock system and the quantum thermal bath. A small eta value cannot adjust the quantum temperature fast enough during the temperature ramping period of shock compression while large eta leads to big temperature oscillation. A value of eta between 0.3 and 1 is usually appropriate for simulating most systems under shock compression. We observe that different values of eta lead to almost the same final thermodynamic state behind the shock, as expected. The quantum temperature is updated every beta (<i>&beta;</i>) steps with an integration time interval beta times longer than the simulation time step. In that case, <i>etot</i> is taken as its average over the past beta steps. The temperature of the quantum thermal bath <i>T</i><sup>qm</sup> changes dynamically according to the following equation where &Delta;<i>t</i> is the MD time step and <i>&gamma;</i> is the friction constant which is equal to the inverse of the damp parameter. The parameter T_init is the initial temperature of the quantum thermal bath and the system before shock loading. For all pressure styles, the simulation box stays orthorhombic in shape. Parrinello-Rahman boundary conditions (tilted box) are supported by LAMMPS, but are not implemented for QBMSST. Because the state of the random number generator is not written to binary restart files, this fix cannot be restarted “exactly” in an uninterrupted fashion. However, in a statistical sense, a restarted simulation should produce similar behaviors of the system as if it is not interrupted. To achieve such a restart, one should write explicitly the same value for q, mu, damp, f_max, N_f, eta, and beta and set tscale = 0 if the system is compressed during the first run. dhugoniot is the departure from the Hugoniot (temperature units). drayleigh is the departure from the Rayleigh line (pressure units). lagrangian_speed is the laboratory-frame Lagrangian speed (particle velocity) of the computational cell (velocity units). lagrangian_position is the computational cell position in the reference frame moving at the shock speed. This is the distance of the computational cell behind the shock front. quantum_temperature is the temperature of the quantum thermal bath <i>T</i><sup>qm</sup>. To print these quantities to the log file with descriptive column headers, the following LAMMPS commands are suggested. Here the fix_modify energy command is also enabled to allow the thermo keyword etotal to print the quantity <i>etot</i>. See also the thermo_style command. The global scalar under the entry f_fix_id is the quantity of thermo energy as an extra part of <i>etot</i>. This global scalar and the vector of 5 quantities can be accessed by various output commands. It is worth noting that the temp keyword under the thermo_style command print the instantaneous classical temperature <i>T</i><sup>cl</sup> as described in the command fix qtb. This fix style is part of the USER-QTB package. It is only enabled if LAMMPS was built with that package. See the Build package doc page for more info. All cell dimensions must be periodic. This fix can not be used with a triclinic cell. The QBMSST fix has been tested only for the group-ID all. The keyword defaults are q = 10, mu = 0, tscale = 0.01, damp = 1, seed = 880302, f_max = 200.0, N_f = 100, eta = 1.0, beta = 100, and T_init=300.0. e0, p0, and v0 are calculated on the first step. (Qi) Qi and Reed, J. Phys. Chem. A 116, 10451 (2012).